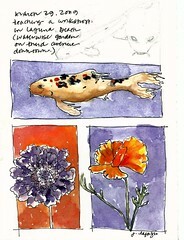 I taught a 'sketching and watercolor: journal style' workshop this past Sunday. 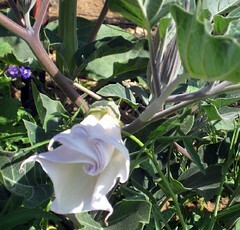 We spent the morning at the beach, then the afternoon at a lovely 'water-wise' garden in downtown Laguna Beach. Husb and I spent the weekend. I'll post photos too. We started the morning workshop on the beach. Wouldn't ya know the day before was sunny and warm, as was the day after. Our Sunday, not so much. BeBop helped with the arrangement of the felt squares. A shrine to my yoga practice. 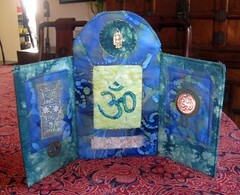 I taught this project in my online joggles class and my monthly Art Quilt class. 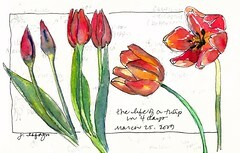 Four days in the life a a couple of tulips. Here's my 3x4' quilt, entitled "Zen Eucalyptus" It's made from felt that I created using the wet-felting technique--then I cut the large pieces of felt into squares and reassembled onto pieces of dyed cotton batting, then backed with a piece of commerical wool felt. There are hours and hours of hand sewing, and it has lots of texture AND it was juried into "EDGES"where it will be seen by thousands of people at the Long Beach Internation Quilt Festival July 24-26. Waay cool! 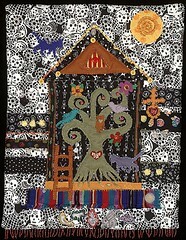 Pacific Coast Fiber Artists & Friends present "EDGES" sponsored by Interweave/Quilting Arts. Cutting edge fiber artists give us a view of their interpretation of the theme "Edges" - the sharp cutting part of a blade, sharpness, keenness; the projecting ledge of a cliff, brink; the part furthest from the middle; border, margin - from nature, architecture, household objects, a silhouette, tools and/or the edge of anything interesting by using colors, contrasts, and textures. This exhibit makes it debut at Long Beach Internation Quilt Festival. This is on one of those Fredrix canvas panels...I started it in a great workshop with Chris Cozen from Golden Paints. This class is a great introduction to small art quilts or for the more experienced quilter, to create their own unique small art quilt. 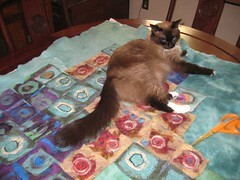 We’ll work in approximately 9x12” or smaller to assure you’ll finish your quilt quickly and be thrilled with the result. During the first class, with Jane’s help, you’ll design your own ‘tree of life’ from your imagination or based on images that inspire you. You’ll learn about fabrics (paper, vinyl metal etc) that you may want to use in your quilt. We’ll cover construction and sewing (either by hand or machine, your choice.) For the second class, you’ll bring in your work in progress and Jane will show you embellishment techniques, embroidery and finishing styles to complete your “Tree of Life.” Lots of individual attention and creative brainstorming and fun. Material list will be emailed to registered students. Husb and I went on a docent led tour at Blue Sky Reserve today, and learned these wildflowers. My hope is to go back and draw them now... Here are the flowers husb photographed while I made notes. 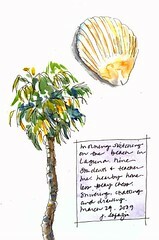 Our San Diego SketchCrawl group went north to Temecula yesterday, to it's thriving Old Town. Tons of people strolling the sidewalks and filling the restaurants..Some of us sat on the sidewalk and drew this interesting succulent. Drove 45 minutes to draw a succulent. Oh well, it was great company! 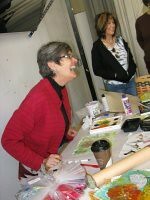 This reminds me, I'll be teaching 'sketching & watercolor: journal style ON LOCATION" in Phoenix at art unraveled and the morning of August 7 we'll be drawing at the gorgeous Desert Botanical Gardens... They'll be lots of glorious subject matter like this one. 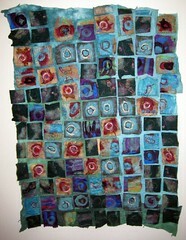 Ha, wasn't it just my last post when I mentioned having fun in my Mixed Media with Paper & Cloth class? Well, here's a photo from Monday's class. 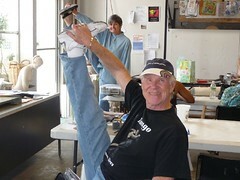 That's Howard (age 75) showing off his skill and that's me (age 58) answering his challenge! ha! I love this photo! We always laugh in my classes. Always. 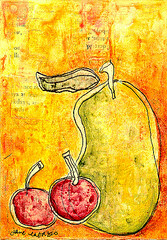 One of my lovely students, Davi, from my Mixed Media with Paper & Cloth class here in San Diego posted pics from our recent class on her blog. Check it out. We really do have a great time!